a beautiful secret. | GLENN RED L.A.
Sean Penn’s character, LIFE Magazine photographer Sean O’Connell, verbally reposts this Thurber quote in the new Ben Stiller film The Secret Life of Walter Mitty, during the scene captured in the above photo. 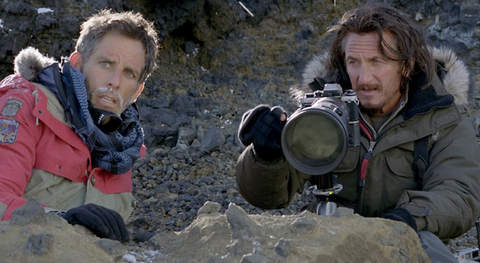 After a protracted search, Stiller’s character Mitty finds Penn’s character atop a Himalayan peak patiently hoping to photograph a fabled but rarely glimpsed snow leopard. At the critical moment of opportunity, O’Connell chooses not to click his camera, instead imparting this quote to Mitty, who is left puzzled as to why the photographer passed on the chance to immortalize the animal in all its glory. GREAT quote, decent movie (has some very nice moments and a notably sweet performance by SNL’s Kristen Wiig as Mitty’s love interest, Cheryl Melhoff, especially in the scene where she sings the David Bowie classic ‘Space Oddity’). This entry was posted in random wisdom.. Bookmark the permalink.